Browsing Moillusions history articles for a while made me realise we haven’t had that many #murals lately. Not being lazy, I started crawling my repository for something cool that could fill the gap, when this magnificent building appeared right in front of me – the photo depicts a mural of a blueprint, painted on a side of a building that used to be a furnishing store. I really liked it. If you look closely, you’ll notice how the second window from the right (2nd floor) is partially obstructed to maintain the illusion. Not sure if this still exists, but I bet our viewers from Portland can share some insight about the building today. It stands somewhere at the corner of Free and Center Streets, if I did my research right. 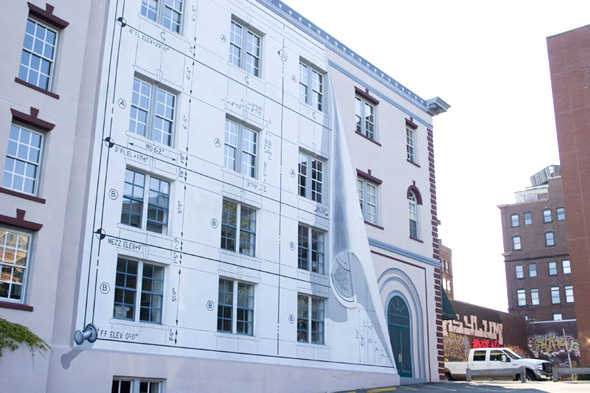 The peeling blueprint of the 48 Free Street mural has become a local landmark since it was painted in 1986 by Chris Denison, C. Michael Lewis, Toni Wolf, Josephine Mussomeli, Steven Priestly, and Bertelle Brookings. Denison, Priestley, Wolf, Chris Hayes, Karen Sarfaty and Scott Kern repainted it in 2002. The peeling blueprint of the 48 Free Street mural has become a local landmark since it was painted in 1986 by Chris Denison, C. Michael Lewis, Toni Wolf, Josephine Mussomeli, Steven Priestly, and Bertelle Brookings.Denison, Priestley, Wolf, Chris Hayes, Karen Sarfaty and Scott Kern repainted it in 2002. Google street view has a 2009 dated image of it. Search 48 Free St, Portland, ME. It faces a parking lot not the street. Not to mention that the doorway also seems partially obstructed! You can see it on the back of the building on street view in Google Earth. I think it is an old view from 2009. Keep up the good work. It’s in Google street view as well but the images are from 2009. I like the way that, from one angle, it doesn’t look real at all-then, from another, it does. Even at different angle it looks perfect. 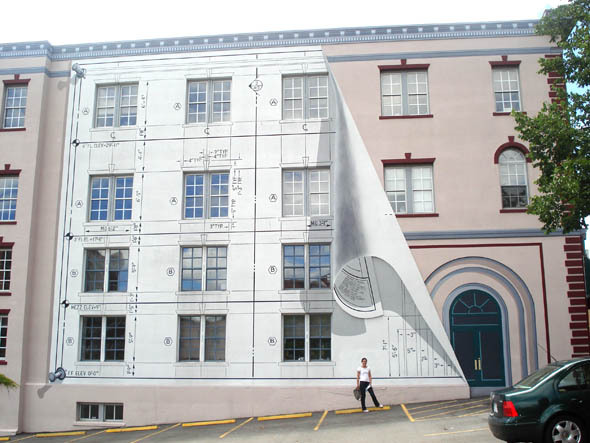 The peeling blueprint of the 48 Free Street mural has become a local landmark since it was painted in 1986 by Chris Denison, C. Michael Lewis, Toni Wolf, Josephine Mussomeli, Steven Priestly, and Bertelle Brookings. Denison, Priestley, Wolf, Chris Hayes, Karen Sarfaty and Scott Kern repainted it in 2002. My favorite part is the “push pins” holding the “blueprint” onto the building…complete with shadows. I also just noticed that the doorway appears to be trompe l’oeil. Very neat. Especially since the mural appears to work from any angle (if you excuse the shadow that will only work for a short time each day). For people in North America (and anywhere else that considers the ground floor to be the first floor), that partially obscured window is on the 3rd floor. For those in the rest of the world (where the first floor is the floor above the ground floor), it’s where Vurdlak described it. Wow! Whacky! I would love to ive in a building like this. It’s not actually a ‘blueprint’ since a blueprint has white lines on a blue background. It’s a ‘white print’ – or just an ‘architectural drawing’.